There’s not a single doubt producers all over the world have been waiting for this: After the huge success of the Kick Free Series so far, Oliver Schmitt aka Sounds of Revolution listened once more to the needs of the music producers resulting in this fine collection of carefully crafted loops! This collection, universally produced on 127bpm does not only leave enough space for your own creativity, but will even encourage it! Oliver Schmitt is a man driven by a passion. Just like Deadmau5, Oliver Schmitt knows the art of creating drum loops that sound spot-on modern with a minimum of ingredients. For someone like me – who rather add than take away – it’s almost like dark magic. But as the old idiom famously says ‘the devil is in the details’ – and that’s what Oliver Schmitts loops are all about. Tiny details that you barely register but perceive as a whole. Being a somewhat decent producer myself – I marvel at the cunning steeped in this collection. The sounds are both carefully selected and masterfully processed. The usage of tonal elements is very clever and the loops are very dynamic – giving a feeling of ebb and flow. One final note about the price. In these days when you can grab gigabyte-sized libraries for 10-20 euros, a price of 64 euros is definitely high. But since the quality of these loops is so exceptionally outstanding – Kick Free Revolution files under investment, rather than expense. Although I really enjoy programming my own drums, loops can sometimes be lifesavers in adding a specific feel or groove. The trouble is, most loop collections are of full drum parts, so if you want to mix your own drum programming with the loops, you have to try and EQ out the kick, or your low end turns to audio mush. Wouldn’t it be great to have just the elements that lend the groove without all the other bits? 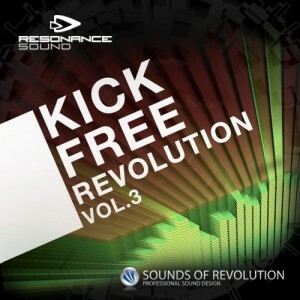 That’s exactly the idea behind Kick Free Revolution Volume 3 from Sounds of Revolution.